mtDNA is known for 10 members. Find out if you are connected to this royal line. This project has 10 profiles for comparison. The French Revolution marked the end of the monarchy when King Louis XVI and Queen Marie Antoinette were found guilty of high treason and executed. But the fate of their two surviving children, Louis-Charles and Marie-Thérèse, has always been questioned. Did Louis-Charles really die at the Temple of Paris? Or did he escape and go on to become a German clock-maker? This is the story of how DNA analyses solved the mystery of the lost Dauphin. In 1770, Louis-Auguste, the future King of France, married Marie Antoinette, the youngest daughter of the Holy Roman Emperor Francis I. For the 15-year-old bridegroom and the 14-year-old bride their marriage was amiable, but the French public viewed this allegiance with Austria with hostility from the beginning. King Louis XVI acceded the throne in 1774 and Marie Antoinette became the last Queen of France before the French Revolution. At first, Marie Antoinette’s political influence made her a popular queen. However, her prolific spending and promiscuous behavior soon turned the public against her, and earned her the nickname “Madame Deficit.” Many also thought that she harbored sympathies towards the French enemies, particularly her native Austria. In the eighth year of their marriage, Marie Antoinette gave birth to a daughter, Marie-Thérèse-Charlotte, the first of their four children. Three years later the Dauphin, Louis-Joseph-Xavier-Francois was born. But he succumbed to tuberculosis at the age of 7. 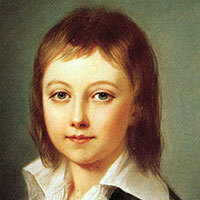 Upon his older brother’s death, the four-year-old Louis-Charles became the heir-apparent to the throne. That same year, 1789, also marked the beginning of the French Revolution. Marie Antoinette and other members of the royal family were first placed under house arrest, then imprisoned in the Temple of Paris. The French monarchy was abolished in September 1792. King Louis XVI was executed in January 1793, after being found guilty of high treason. Marie Antoinette and their two surviving children, Louis-Charles and Marie-Thérèse, remained imprisoned in the Temple. Many of the official records around Louis-Charles last months were lost under the Bourbon Restoration. Hence, some facts are known, while others may be just rumors. After his father’s execution, Louis-Charles became the King of France, Louis XVII, in the eyes of the royalists. Yet, the monarchy had already been abolished, so he never took the throne. Instead, he remained imprisoned in the Temple with Marie Antoinette and his sister Marie-Thérèse. In July 1793, Louis-Charles was separated from his mother and sister. He was put in the care of a cobbler (Antoine Simon). He never saw his mother again, as Marie Antoinette was executed in October 1793. The Simons’ were entrusted with transforming the young Louis-Charles into a staunch republican citizen. Some stories claim that he was cruelly treated during this time. Others state how he was treated well and encouraged to eat and drink to excess. The Simons left the temple in early 1794, and Louis-Charles was restricted to a small, windowless room. According to legend, he had virtually no human contact for 6 months, with his food passed through the bars of his room each day. In mid 1794, a new guardian was appointed, and his care improved. Yet, from October 1794, he refused to speak, and rumor has it that he never spoke again before his death in June 1795. In May 1795, Louis-Charles became seriously ill. A doctor was summoned, but he mysteriously died before he could attend to the boy. It was several days before two other doctors were called. But by then it was too late, and Louis-Charles died on 8th June 1795. The autopsy revealed that he had succumbed to “scrofula,” a chronic infection associated with tuberculosis. During the autopsy, the physician removed the heart of Louis-Charles, smuggled it from the temple, and preserved it in distilled wine. The heart was passed through several people over the years, before it was put in the necropolis of the Kings of France in Paris. Did Louis-Charles really die at the Temple of Paris? Needless to say speculation and rumors surrounded the death of Louis-Charles. Some even wondered whether the boy who died in the Temple was truly Louis-Charles. Throughout history, historians have wondered whether he actually escaped from the Temple, and another young boy died in his place. Adding to this speculation, several people later claimed to be Louis-Charles. Wilhelm Naundorff was the most notable claimant. He was a German clock- and watch-maker, who was buried under the name of Louis-Charles Duc de Normandie. Wilhelm Naundorff and his descendants were permitted to use the name ‘de Bourbon,’ the name of the French royal family. The case remained a mystery for over a century, until modern DNA testing allowed historians to finally put it to rest. They also obtained samples from several maternal relatives that would share the same mitochondrial DNA (mtDNA) profile as the true Louis-Charles. Mitochondria are the energy-generating powerhouses in our cells. The mtDNA within these organelles is special due to its strict maternal inheritance. Both males and females inherit mtDNA from their mother, but only females pass the mtDNA down to the next generation. Thus, providing a useful way of tracing maternal ancestry. The reference samples in this study were all maternal descendants of Louis-Charles’ maternal grandmother, Empress Maria Theresa. Three regions of mtDNA tcan be analyzed – HVR1, HVR2 and the coding region. HVR1 and HVR2 contain the most ancestral information because these two regions have the most mutations. So, DNA profiles were generated for the HVR1 and HVR2 from each reference sample and each putative Louis-Charles sample. The hair samples belonging to Marie Antoinette and two of her sisters (Johanna-Gabriela and Maria-Josepha) resulted in poor quality mtDNA, due to the age of these samples. However, the samples obtained from two of Maria-Theresa’s living descendants (Queen Anne of Romania and her brother André) yielded high quality mtDNA. So, scientists could accurately determine the mtDNA profile of Maria-Theresa and all of her maternal descendants, including Marie Antoinette and the true Louis-Charles. This mtDNA profile was compared to that obtained from Wilhelm Naundorff and the heart tissue from the boy in the Temple of Paris. The DNA tests conducted in this study defined the mtDNA profile of Louis-Charles, Empress Maria-Theresa and Queen Marie Antoinette. Other notable historical figures in this maternal lineage include two Holy Roman Emperor (Joseph II and Leopold II), Maria Carolina (Queen of Naples and Sicily) and Francis I (King of the Two Sicilies). If you have taken the DNA Maternal Ancestry Test, you can compare your mtDNA against members of this notable family to see if you may have descended from the same maternal lineage. Jehaes E et al. (1998) Mitochondrial DNA analysis on remains of a putative son of Louis XVI, King of France and Marie-Antoinette. Eur J Hum Genet.6(4):383-95. Jehaes E et al. (2001) Mitochondrial DNA analysis of the putative heart of Louis XVII, son of Louis XVI and Marie-Antoinette. Eur J Hum Genet.9(3):185-90. Are you ready to explore your ties to French and Austrian royalty?